Andreas Mares is a passionate artist: a trait that shows not only in the motivation that drives his art, but also in the way he goes about his work and, more than anything , in his work itself. His works, drawings, objects and videos, are far from pompous; on the contrary their reduced and clear aesthetic gives an elegant quality to them. Beneath their luring surface lies a passionate and wild intensity that moves and stirs us. 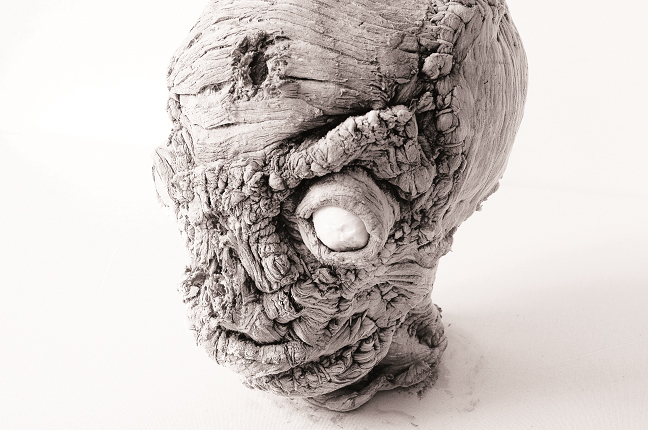 In his work he deals with primary topics of birth, death, fear and the artist’s fragile self. In his work the spectators find themselves reflected. Andreas Mares’ videos, also considered filmed performances, have a meditative character. The videos’ repose only serves to intensify the poignancy of his work; a work which allows him to question about the real existence, creating emotions that get under one’s skin. His series köpfe consists, at present, of five heads. These heads are made of animal meat and preserved in cylindrical glass jars. The missing skin provides a deeper insight and at the same time the absence of this protective layer is revolting. The heads mirror what we refrain from acknowledging, they are like a glance behind the scenes into the shadows of our self. In Psychotrauma (2008) the trauma is caused by limitations and restrictions, and thus behavior patterns are set. These has sutch a negative impact on life that one is no longer in tune with one’s self. The doll made of flesh and skin is but a proxy. The performance Psychotrauma was captured on video and edited several times, the film now takes about 9 minutes. The exhibition Psychotrauma contains a series of drawings that are reflections on the process of regaining one’s own inner child, of establishing a balance between the urges of the Id and the realisations of the Ego; two large canvases consisting of imprints of the bloody outline of the inner child before and after the performance; doll and mask in jars preserved with formaldehyde; video-stills of the performance, as well as the chamber of performance folded up and assembled like a blueprint which is the final physical statement of the resolved trauma. 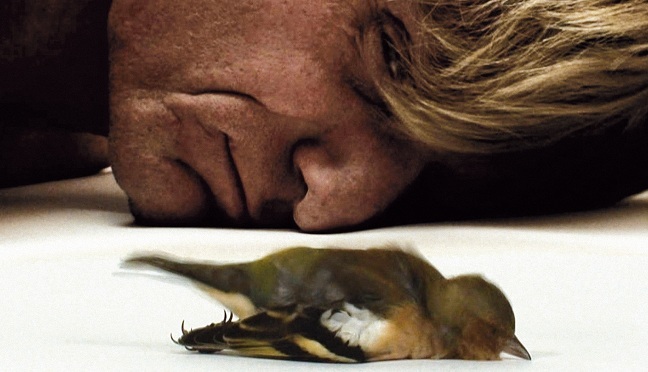 In Mares’ video zugvogel (2008) a bird crashes against the artist’s window pane and this event is the mirror of his own inner journey, full of inner questions as “where do I stand? Wherever I go? How much time remains?”. The basis for the video re.birth (2012) is a performance in which is reflected the effect of one’s own birth on the personality and behavioral pattern. The birth sets pattern of contact: looking back brought us the opportunity to change these patterns and to increase our empathy and authenticity. With …journey (2012) Mares starts from the outer, to find out his inner perception. His last video child (2012) born from the strong need of the artist to accuse and stop the violence against children. As Mares says: “Violence against children in our society is multi-layered, subtle and it is also everywhere. It ranges from an act of non-acknowledgement of a child’s fully fledged personality, or depriving a child of its autonomy and individual personality as well as talents, or directive communication, to physical violence. […] This is unacceptable and needs to be stopped”. Born in Linz (Austria) in 1969, he started drawing in 1980, using coal and, sometimes, blood. From 1990 to 2006 he produced paintings with oil and mixed technique and in 1994 he created his first object made with meat. His first action goes back to 2006 and many others performances has been acted until today, coming along with several videos. Mares’ video zugvogel is in the “Videoholica” special selection 2012 and it is part of the production of Von Roland Schimmelpfennig‘s “Der goldene Drache“. His artworks was exhibited and screened at “Videoholica“, July 2012 (Bulgaria); “Hidden Cities & Hybrid Identities” festival, July 2012 (Italy); “Hidden Cities” festival, May 2012 (Turkey); “PAN International Videoart Festival“, April 2012 (Italy); “Hidden & Forbidden Identities“, February/March 2012 (Italy) and at “Große Kunstausstellung“, July/August 2011 (Germany). Mares is one of the winners of “Magmart VII Edition” (2012) at CAM (Italy) and his video re.birth has been admitted in “Magmart’s Hall of Fame” and inserted into the permanent collection of CAM.